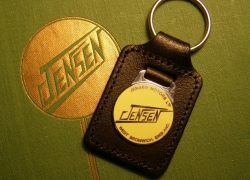 Item description: Jensen 541R keyfob. Beautiful primrose yellow enamel on chrome, bearing Jensen Motors’ logo. The fob in stitched black leather.